I really enjoyed my stay the staff was wonderful very friendly food was on point😊 . Very clean place right on the ocean. The breakfast was awesome each morning. Only downfall was there wasn’t a hot tub and the bathroom was a little small. Regardless I would stay here again. Had a wonderful time at their Luau. Everything was clean and very hospitable. Enjoyed both pools and the Tiki Bar. Very nice place for a vacation. So you're kicking around the idea of a holiday to Daytona Beach Shores? If you want a place to call home that's located near some well-known Daytona Beach Shores attractions such as Beach at Daytona Beach, just go to Orbitz, choose your travel dates, and voilà! Review the list of hotels and other accommodations to identify those that are near what you want to see while you're in the area. We make it easy to find a convenient flight to Daytona Beach, FL (DAB-Daytona Beach Intl. ), which is 4.9 mi (8 km) from the city center. Find the ideal flight in a flash by using the filters on our site to narrow down your search. 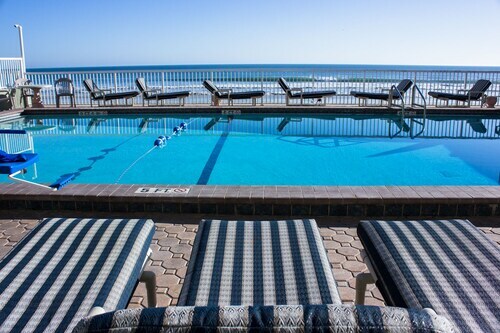 Take a dip when you stay at one of these Daytona Beach Shores properties, popular for their pools. What's the Weather Like in Daytona Beach Shores? 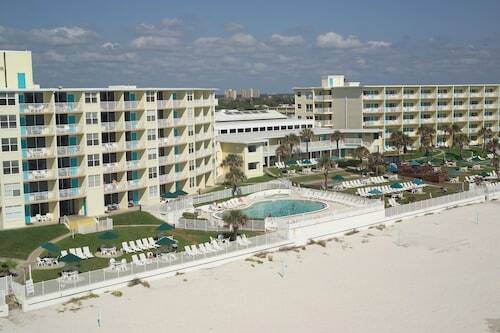 Great location on the beach, plenty of parking, clean, bar/restaurant staff outstanding. Definitely will go back.